Recently, Van Cleef & Arpels designed a watch that does not only display time and date (via a shooting star), but also the real-time position of six planets (Mercury to Saturn), represented each by a different gemstone. The creators called it "Midnight Planetarium Poetic Complication". 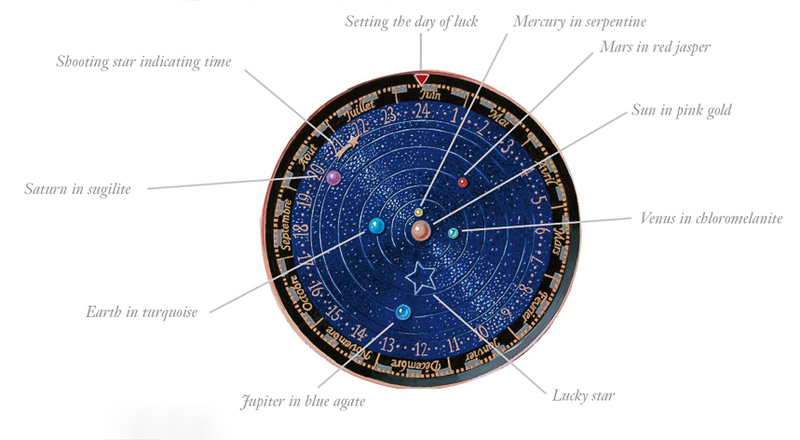 It is a large watch (diameter = 44 mm) with some special features, such as the lucky star (see picture). Lovely and very limited, the Midnight Planetarium Poetic Complication watch will be part of a limited edition of just 396 pieces total. Price is $245,000 in 18k rose gold and $330,000 in 18k rose gold with diamond decoration. Last edited by Cogito Ergo Sum; February 5th, 2014 at 04:20 AM. Another Earth In Our Solar System. Where is the closest analog of Solar system? Very cool, but how about one for those of us who aren't Elon Musk or Richard Branson? EDIT: Just a weird observation, but why does the watch model look like he shaves his arms? He did not shave his arm. The watch was so awesome around his wrist that his arm hair spontaneously left. So, basically, there are very few scientists who could actually afford this. shlunka and Cogito Ergo Sum like this. hmm. 330k Let me see. I could buy a nice house with plenty of land. A boat, 3 brand new 2014 porsche off the line, 330 thousand 1 dollar hotdogs for friends.